In the late 1960's AMT modified many of their outdated annual kits to maximize the investment of their kit tooling. 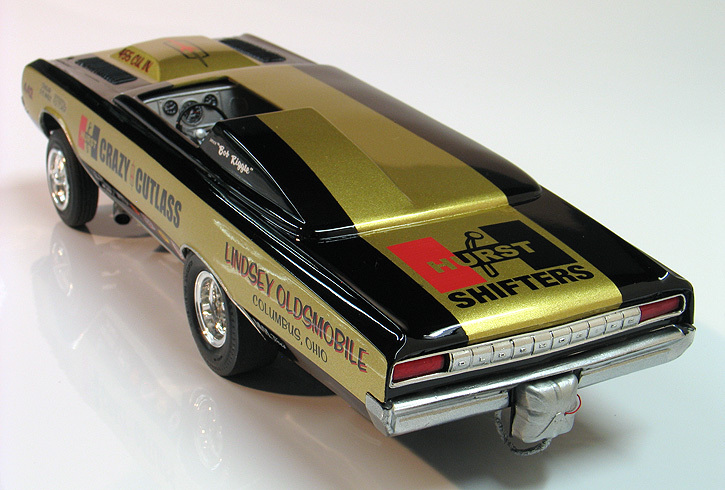 Part of their efforts went into a series of altered wheel base drag cars kits. The series included a 1964 Falcon, 1965 Mustang, 1965 Chevelle, 1965 Chevy II, 1963 Tempest, 1967 Cyclone and this 1964 Oldsmobile F-85. All of the kits were much modified from their stock counterparts with the Olds being modified the most. Besides losing all the stock parts & being changed to an altered wheel base chassis design, the body also lost it's roof and was replaced with a custom tonneau cover. A few years ago, the Model King re-issued much of the old AMT series except for the Chevelle and the F-85 kits. I spoke with Dave Burket (owner of Model King) about these lost cars and he said that he requested to re-issue them from RC2 (which had control of the tooling for these kits at that time) and was told they could not be located. At least for now, sadly these kits seem to have disappeared. re-issue I set about on a mission to complete the series by building the last three. Original AMT F-85 kits seemed very hard to find and the prices were much higher than I wanted to pay. Fortunately, there have been a few small aftermarket companies that have made resin re-pops over the years. To build this model, I used a resin kit that I found on ebay at a reasonable price. Since this kit didn't seemed to be based a real car, I decided to give it a fictional paint scheme. In the late '60's and early '70's Hurst Corporation created a series of exhibition drag cars and also did a series of Oldsmobile special edition cars. Building my kit into a fictional Hurst Olds F-85 seemed like a natural, so I built it as how I imagined Hurst would have built a car like this back in the day. 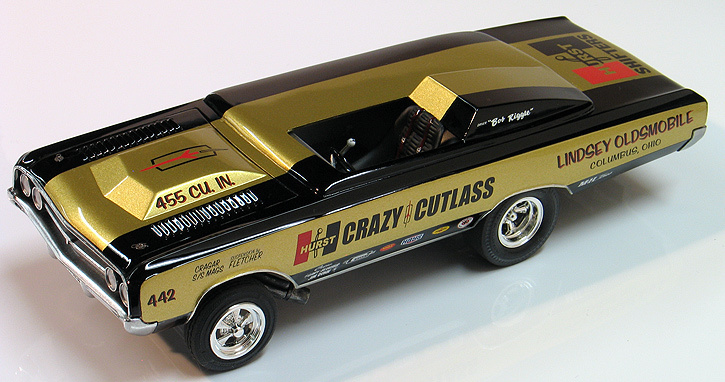 I created my own custom art work for graphics and gave it the name "Hurst Crazy Cutlass". Since my kids first names all sound like last names I usually try to work them into the design of fictional sponsors. My daughter Lindsey became the inspiration for a fictional local Oldsmobile dealer. I then had custom dry transfers made from the art to use on the model. The smaller secondary sponsors came from various bits of left-over decal sheets I had in my parts box. 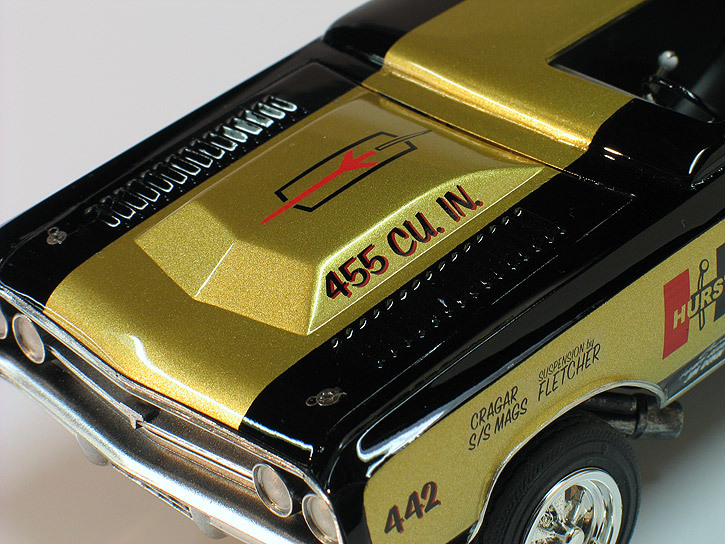 I patterned my paint job after the "Hurst Hemi Under Glass" Barracuda. For paint I used PPG automotive base coats in gold and black. After applying the dry transfers, decals & chrome foil, the paint was covered in PPG urethane clear. Since the resin F-85's bumpers came unplated I sprayed them with Alclad. The resin kit I bought came with the body parts only. No problem though because the original chassis and interior were generic parts that were shared with the recently re-issued '63 Pontiac Tempest AWB kit of which I already had several extra. I used mostly everything from the Tempest kit with the exception of a couple small changes. I swapped out the Tempest's two-piece plastic tires with more realistic looking H&M Racemaster "pie-crust" style slicks from the Revell '64 T-bolt kit and front tires from my parts box. The Tempest's drivers seat looked rather smallish, so I located a better one (also from my parts box). A third trip the parts box netted the wheelie bars. 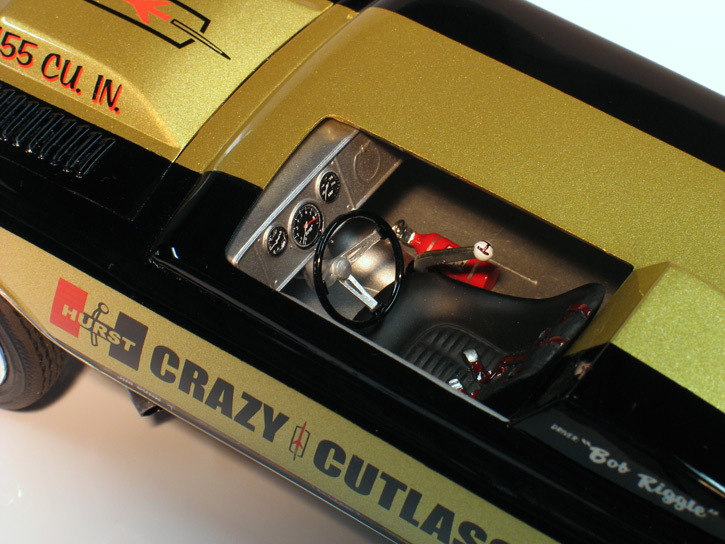 Finishing touches on my Cutlass included wiring up the drag chute with chute lines & a rip cord and adding photo-etched hood pins to the hood. I was real happy with how the Cutlass turned out. 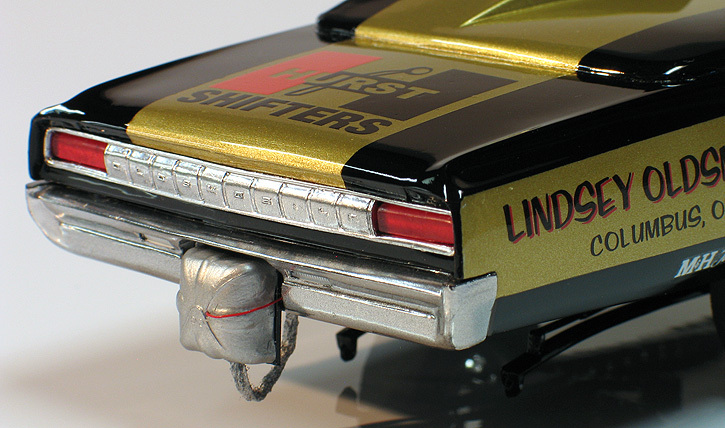 I've also got a resin copy of the '65 Chevelle in my stash and a couple of the Mustangs. A few more to build and I will have the series complete.